Activists are using social media to campaign for the revival of Egypt’s tourism sector, which accounts for a tenth of the country’s GDP. They marshaled themselves on Facebook and Twitter to bring a dictator to his knees. Now the youth of Egypt are using the social network to help their crippled tourism industry get back on its feet. The winds of change that have swept across the Egyptian Sahara started blowing when a group of young cyber-activists created the Facebook page “We are all Khaled Said” in memory of a 28-year-old businessman beaten to death by police in the Egyptian port city of Alexandria last June. The page collected more than 400,000 followers and quickly became a rallying point against Egypt’s autocratic government. The online epicenter of the protests culminated in the 18-day-long demonstration at Cairo’s Tahrir Square and subsequent ouster of Hosni Mubarak’s three-decade-old dictatorship. However, having experienced firsthand the enormous potential of social media, Egypt’s digital-savvy youth are far from content with just political change. They are once again harnessing the power of social networking, this time to revive Egypt’s crucial tourism sector, which has been hit hard by the upheaval. Various Facebook groups have been created to lure back the roughly 1.2 million visitors who fled Egypt during the revolution, which caused a notional revenue loss of nearly $1 billion for the country’s tourism industry. Some of these groups are holding real events to publicize that Egypt is now safe for tourists, while others are organizing virtual events to urge nations to lift restrictions on travel to Egypt. For instance, the Facebook page “Economical Reform Initiatives” recently organized a walk to Cairo’s National Museum. Another page — “Support Tourism in Egypt” — is requesting comments, which it plans to send to various tourism boards across the globe in the form of a collage. Similarly, the “Support Tourism in Sharm El Sheikh” page is campaigning for the Red Sea resort town of Sharm El-Sheikh, which saw hotel occupancy rates drop to 11% from 75% during the protests, according to Reuters. Tourism is the backbone of Egypt’s economy and accounts for an estimated 10% of its GDP. The sector provides employment to approximately 1.8 million Egyptians directly and 5 million Egyptians indirectly, according to a Financial Times report. The report quotes Simon Kitchen, vice-president of research at investment bank EFG-Hermes, as saying that Egypt’s tourism sector garnered revenues of $11.6 billion for the financial year ended June 2010 and $3.7 billion for the third quarter of 2010. 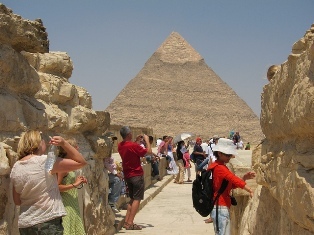 The U.K.-based travel website Wanderlust estimates that around 15 million tourists visited Egypt last year. It is significant, therefore, that the social media initiatives seem to be working. While the military council in charge of Egypt’s interim government has quickly reopened the numerous tourist sites in the country, international airlines have started reinstating their flights to Cairo. Further, various countries have begun lifting travel restrictions. For instance, the U.K.’s Foreign and Commonwealth Office (FCO) has relaxed the travel advice it issued on January 28 for British citizens traveling to Egypt. Sweden and Poland have also eased travel restrictions. Clearly, Egypt now has two wonders to showcase — the pyramids of the ancient world and the power of social media in the modern world.